As if the control of industrial noise was not difficult enough, clean room environments impose sanitation constraints diametrically opposed to the basic construction of noise control materials and systems. Historically, the generic properties of acoustic materials were permutable combinations of fibrous batts, perforated metals, and porous substrates. Of course, any materials which would generate particulate matter, harbor micro-organisms, or create stagnant air pockets was the bane of a contamination control system. The net result was a relegation of nosie control to a very low priority and clean room personnel had to live with an unacceptable or marginal acoustic environment. With so much attention focused on the need for aseptic acoustics, a number of products emerged which specifically addressed the peculiar needs of clean room environments. Amazingly, many of these products and systems not only exhibit superior noise control capabilities, but also enhance the ability of all clean-air components in the facility to achieve and maintain the desired level of cleanliness. The solution to any problem begins with the identification of its basic factors; clean room noise is no different. The acoustic element may be reduced to source, path, and perceiver. Noise can reach a listener's ears via several routes. The most obvious route for noise sources within a workspace is the direct path, a straight line through the air from source to perceiver. The acoustically hard surfaces found in clean rooms make reflections from the walls, ceiling, floor, or any solid object contribute as much or more to the acoustic ambiance than the direct path. 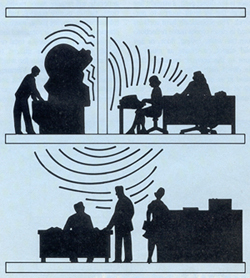 The persistence of sound in an enclosed space, as a result of multiple reflections after the sound is stopped, is called reverberation. This phenomenon is illustrated in figure 1. Also, when acoustic waves are propagated through solids and air, they may travel a direct route through floors and walls and arrive at the perceiver after reradiation, as shown in figure 2. Generally, the most cost-efficient and dramatic means of reducing noise levels is to reduce the acoustical output of the source itself. This approach generally will require major modifications, tighter quality control, tighter tolerances on moving parts, more sophisticated balancing or rotational mechanisms, and sometims a total redesign of the technique utilized to perform the task or tasks for which the equipment is intended. Vibrating surfaces will cause compression and rarefaction of the air which is perceived as sound, and any of the above mentioned modifications to a sound source are aimed toward reducing the vibration of any component to its lowest possible level. Normally, these modifications are not within the capability of the user and must be left to the equipment manufacturers. At the end of the noise control path is the perceiver. The most expedient method of controlling noise exposure at the perceiver's end usually means removing the affected person from the sound field. When this cannot be done, the alternative is to have the person wear personal protective devices. This process is actually considered a control on the path of the noise. A dramatic reduction of source noise may be achieved with total enclosures and partial barriers. Common industrial acoustic materials are unsuitable for sanatized environments due to their construction of fibrous material and perforated facings. Assembled structures can promote the growth of micro-organisms and cause a genuine hardship for the cleaning crew. Once assembled, these enclosures, typically eight pounds per square foot of wall and ceiling, are difficult if not impossible to move for equipment maintenance. Acousticians and material engineers have collaborated to develop noise control products from light weight plastics with acoustical resonance qualities. Environmentally stable, these systems are chemically resistant and may be repeatedly washed or steam-cleaned for sanitation purposes. Formed from transparent, rigid plastic sheets, there are no cracks or crevices for particulate accumulation. A system may be made hermetically tight for total mist and fume containment. 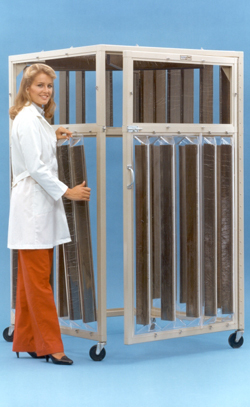 A sterile environment may be maintained within the sound enclosure for cost effectiveness. 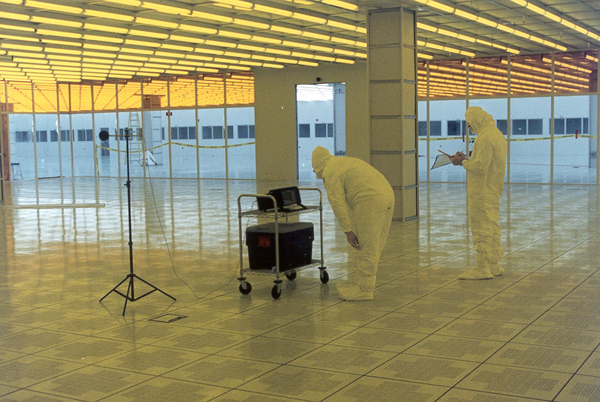 Then the entire area would not be subjected to more rigorous clean room standards. Larger structures may require an integral support frame. The use of aluminum rather than steel in the construction of these frames is recommended for two important reasons. First, treated aluminum does not give off the numerous oxide compounds associated with steel. Second, aluminum is considerably lighter, and much easier to handle and install, resulting in overall cost savings and portability of the system. However, the elements should be treated with an iridite finish before they are painted to arrest the growth of the single oxide associated with aluminum. Combining the above features, a system may be developed which not only reduces source noise but also may improve the sanitary atmosphere surrounding a process. A clean room compatible design featuring portability for time-sharing among noise sources is pictured in figure 3. Many times a clean room will exhibit an unacceptable sound pressure level even before the first piece of processing equipment is brought on line. For industrial usage, filtered airflow velocities of 40 feet per minute or higher are frequently used to minimize the effects of lateral dispersion of particulate and matter. This means large air moving devices, and large air movers means big noise. Major noise components associated with air systerns and air stream sources are identified in figures 4 and 5, respectively. Noise generated from dynamic unbalance can be reduced using conventional vibration isolators and acoustic materials, since the equipment is usually outside the clean air loop. However, the noise modulated air stream is a different situation. Air noise cannot be exposed to sound absorbing, fibrous materials due to the inherent danger of particulate entrainment and subsequent clogged HEPA filters and room contamination. Fortunately, air noise can be handled effectively in an aseptic manner. Since air duct interiors are safe from physical abuse, faced or encapsulated absorbers make excellent linings in sound traps. Linings are more acoustically efficient if located at transition points along the duct, for instance, at a right angle bend or drop. 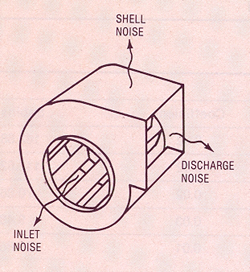 An effective alternative is a broadly tuned, Helmholtz resonator at the inlet, and discharge of the fan or blower. A direct antithesis of th the Helmholtz phenomenon is blowing across the neck of a partially filled bottle to produce a tone. If noise modulated air is passed by a properly tuned cavity, sound is actually absorbed at a specific frequency. When a number of differently tuned resonators are ganged together, a broader band of noise is absorbed. Since there is no fibrous packing in this silencer, there is little chance of contamination. An augmentation of the duct treatment is a plenum chamber as illustrated in figure 6. In some installations, especially where more than one fan or blower is used, a plenum enclosure may be a utilitarian choice for sound suppression. A plenum's acoustic performance will be greatly increased (by approximately 10 dB in some frequencies) if the interior surfaces are lined with encapsulated or faced absorbers. If duct linings or silencers are incorporated with a lined plenum chamber, ventilation noise, for virtually any size air system, would be insignificant. The perceived noise in the workspace is the last consideration. Acoustically hard surfaces in a clean room will resemble a reverberation chamber, creating spatial sound problems even if the area is noise-free. Sustained sound levels garble verbal communications and support an uncomfortable environment. An acoustic ceiling, thick carpeting, and wall coverings ordinary would solve the problem. However, this solution would be unacceptable for a clean room. New advances in film technology have produced. Encapsulating materials which are mechanically rugged and nearly transparent to a sound wave. 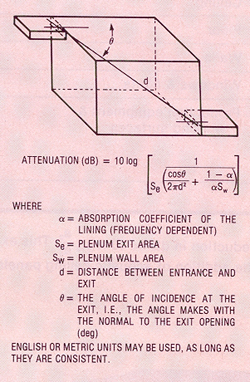 Encapsulated absorbers may be incorporated as ceiling panels as in figure 7, free hanging baffles, or sealed to walls out of the way. Reduction in dB = 10 log10(a2/a1). The addition of acoustic ceiling panels creates a 13.08 dB reduction. Encapsulated products are most frequently pressed into service as component parts of a ceiling system. An example of noise reductions afforded by such a system is evident in table 1. Note the example is for a single frequency. To calculate anticipated dBA reduction for the space under study, the computation would have to be repeated for each octave frequency of concern, dBA weighting factored in, and logarithmically summed. Reverberation control in closely packed machine environments can be an effective noise control sound measure. In spaces far from the sound source, approximately 20 feet or further, the addition of absorbent materials can reduce the reverberant build-up by 10 dB or more. Often these remote areas are highly populated and will afford sufficient noise reduction without further engineering controls or personal protection. It should be noted however, that usually little significant reduction is achieved within 10 feet of the source, which commonly includes the operator. Aseptics and acoustics need not be mutually exclusive pursuits. Noise control systems can function in clean room environments while providing many years of trouble-free service, creating a pleasant working atmosphere conducive to maximum efficiency. © Acoustical Surfaces, Inc. - All Rights Reserved.